On January 26, 2018, young leaders and clergy from the wide range of religious communities concluded the first cycle of meetings and discussions in Montreal. 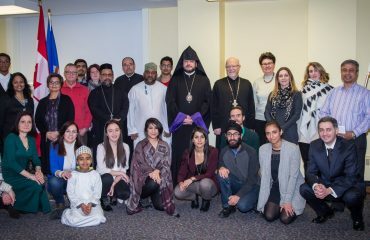 Throughout the week, youth and clergy from 14 different religious communities representing Christianity, Judaism, Islam, Sikhism, and Buddhism, have gathered under the auspices of Bishop Abgar Hovakimyan, Diocesan Primate, at St. Gregory the Illuminator Armenian Cathedral in Outremont, to exchange wisdom about each other’s religion, and to reflect on Canada’s religious diversity. 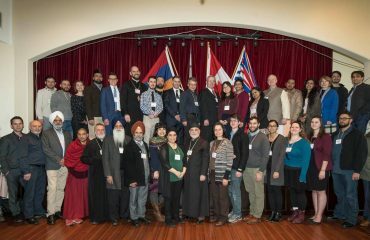 These wonderful gatherings were made possible thanks to the support of the Federal Government of Canada for the “Celebrating Our Diversity Now” youth interfaith project initiated by the Armenian Diocese of Canada. The event was organized on the occasion of the World Interfaith Harmony Week proclaimed by the UN General Assembly on October 20, 2010. The Diocese had elaborated the Project to mark the “2018 Year of Youth” proclaimed by His Holiness Karekin II, Supreme Patriarch and Catholicos of All Armenians. On this occasion, Bishop Abgar Hovakimyan, Primate, gave his blessings to focus on promoting youth interfaith dialogue. In his welcome speech, the Spiritual Head of Canada’s Armenians mentioned, “while preparing the project, we were looking for creating preconditions for building new bridges and reinforcing the existing ones among the religious communities, especially among the youth. We are grateful to the Federal Government of Canada, who agreed to support this initiative”.